Guest writer Yvette Larsson starts a new series of articles, discovering Romanians who inspire. This week she talks to Romanian composer, pianist and producer Bogdan Ota, who became famous while at Norway's Got Talent. Bogdan Ota, the 35-year old Romanian pianist born in a small town in North-Eastern Romania, caught my attention after a member of the Bucharest Lounge Facebook page sent me a link, to listen to one of Mr Ota’s performances. It moved me on a profound level to read about his life-story and to listen to his music. His music spoke the language of the history of the Romanians, their struggle – and their beauty! How did you get into music ? What inspired you? I remember when I was about 3-4 years old and I found my father’s guitar in the house. He is a doctor but he had a guitar as a hobby. From that point on, I started trying to play and create music. I was fascinated , and I still am, by anything that can produce beautiful sounds, in just one word: MUSIC. My first contact with the piano's sound was at a concert. My father used to go to classical music concerts. I was not so impressed back then, but later, when I was about seven years old, and I was in my first year of school, I remember that a former student of my teacher came to our class room and start playing piano. I was completely fascinated. Since then the piano has been forever in my heart. My parents bought me one that year and that became my toy, my holiday, my lover, my everything. I was well and professionally trained during the years and I was trying to be one of the best. One can never succeed to be the best pianist. There is no such thing. After graduating ‘Stefan Luchian’ Music Highschool of Botosani, at age 18 he was admitted first to ‘George Enescu’ Music University of Iasi- Department of Instrumental Interpretation. In 2003 he graduated from ‘George Enescu’ Music University and took a degree in Instrumental Interpretation – Piano Major. What is your drive when composing music? The music comes to me by inspiration. It’s like a dream, I cannot explain it. It is like a person who goes to sleep and a dream occurs. This is inspiration. You cannot demand to be inspired in a certain day, same way you can not demand to have a certain dream in a certain night. This is how I compose music. If I am not inspired I’m not writing. Sometimes my ideas come when I’m sleeping, sometimes when I’m driving, sometimes when I just sit down and do nothing… it’s not a phenomenon I can control. In 2010, when the financial crisis that has shaken the Romanian economy, Bogdan left the country, heading to Norway. After a few months of working in a heavy-duty job, he was secretly listed by his boss in a television contest, Norway's got talent, which helped him be discovered by Sony Music Norway. 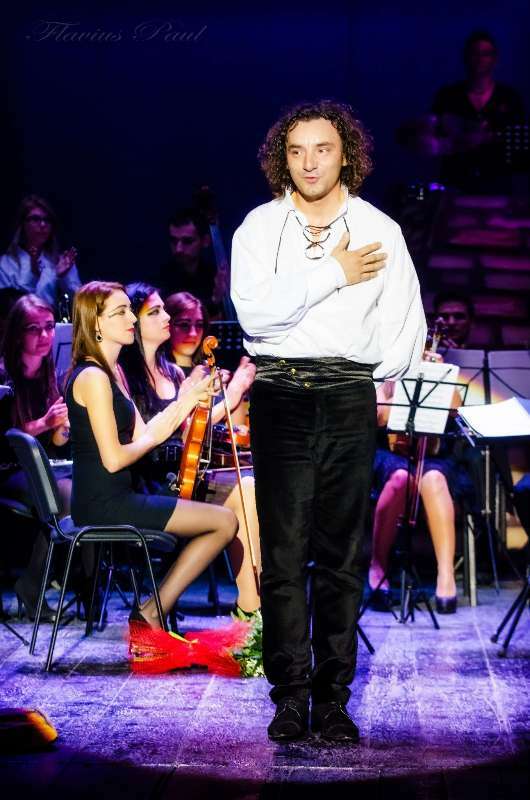 Another huge success was ‘The Extraordinary Concert Bogdan Ota ‘. The concert took place in the Constitution Square in Bucharest and it was his first performance with the National Orchestra and Radio Choir conducted by the famous Tiberiu Soare. That night, in front of the House of Parliament, over 30.000 people gathered to enjoy his music. How did you feel when playing in front of the House of Parliament with approx. 30,000 people coming there to see you? Most of my dreams came true but the most important one became reality in Bucharest on 17th of September 2011. My concert at the Parliament Building was the first one in my career after Norske Talenter, a real success and the best reason to be proud. I was playing along with one of the best Romanian Orchestra’s, with a famous conductor and the audience was overwhelming in numbers and in how they were reacting to my music. My parents were there as well. That was the moment when I became absolutely sure that what I was doing was right. My emotions were huge of course, I would be lying if I said otherwise, but between the songs I was watching all those people gathered there for me and then the sky and I remember I kept thanking God for everything in my life. What does Romania mean to you? Yvette Larsson is Swedish, born 1972 in Gällivare, Lapland. She has a Masters of Arts / Upper Secondary School Teachers’ degree from the University of Umeå, Sweden. There she studied English, Swedish, Education, Media & Communication and Science Journalism. She has 13 years of experience as an ex-pat: she lived and worked in The Reunion Island, Norway, France,UK, and Denmark. Yvette has worked with Sports Management for ten years and is a Coach and Leadership Trainer, passionate about facilitating individuals and organizations to find and express their values & visions, talents and impact in the world. Yvette runs the blog and a Facebook -page called The Bucharest Lounge, where she rebrands Romania with beauty and meaning and where she models a new generation of leadership in Romania, all seen through her Swedish lens.